This mod is my humble attempt at yet another UI mod. This mod is and always will be pure xml edits only. 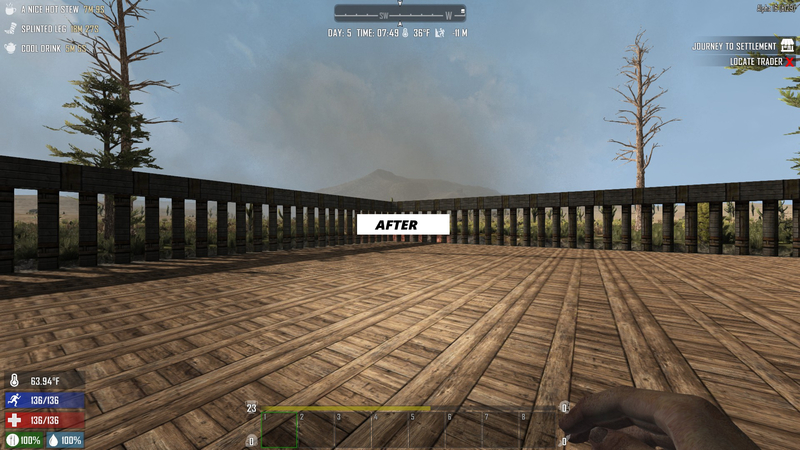 This mod adds some extra HUD bars and info to the UI as well as rework the toolbelt and increase player built storage, minibike storage, forge input, crafting queue, and all workstation outputs. Here's a list of some of the changes. Removed borders from toolbelt slots and bar. Toolbelt backround is now a very transparent black. 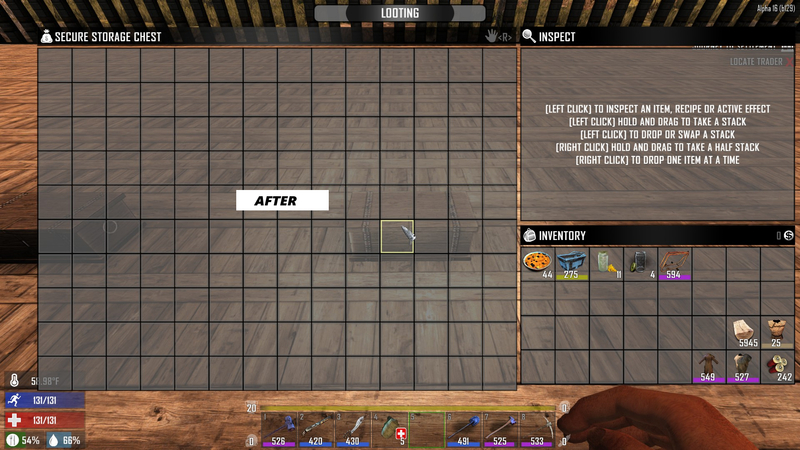 Toolbelt slots now have key numbers in top left corner. Toolbelt holding color is now green. 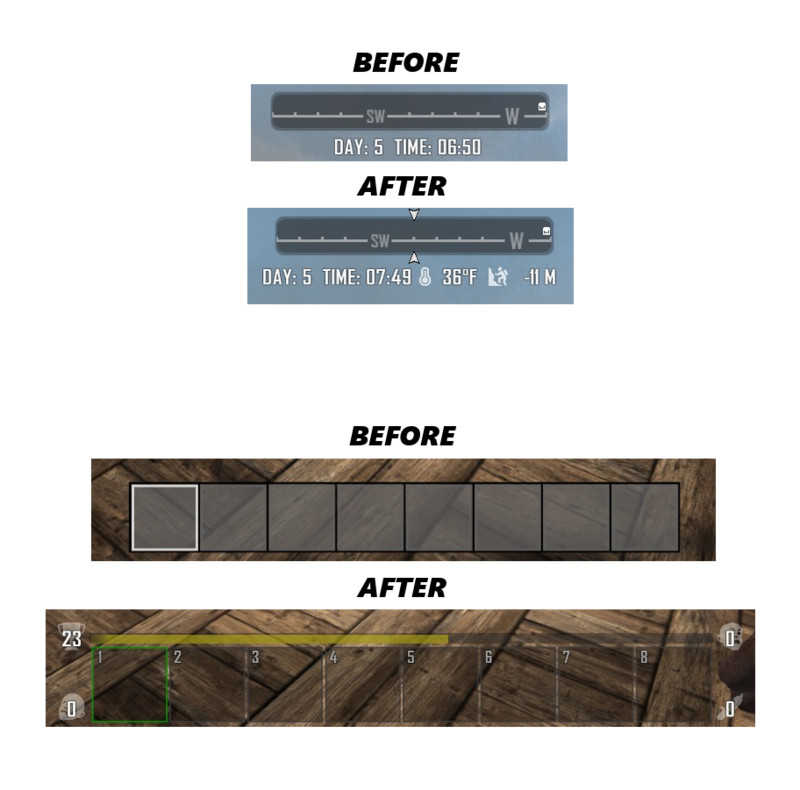 Experience progress bar added above the tool belt. 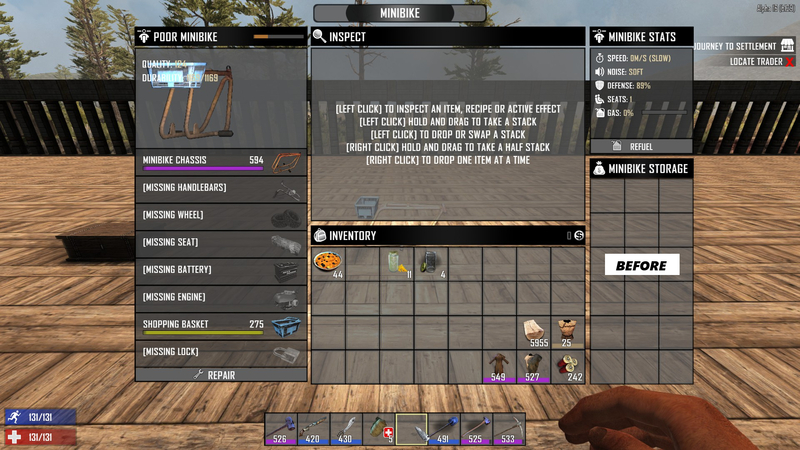 Player level with icon added to the top left of the toolbelt. Player deaths with icon added to the bottom left of the toolbelt. 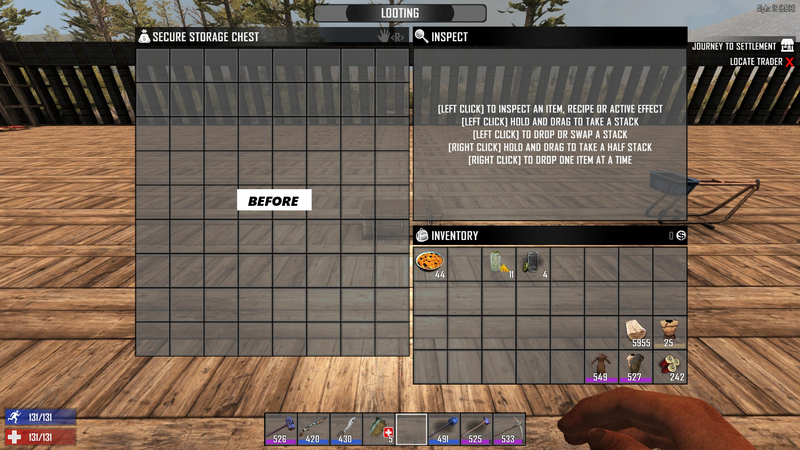 Zombie kill counter with icon added to the top right of the toolbelt. PVP kill counter with icon added to the bottom right of the toolbelt. Added an outline to the quest tracker. 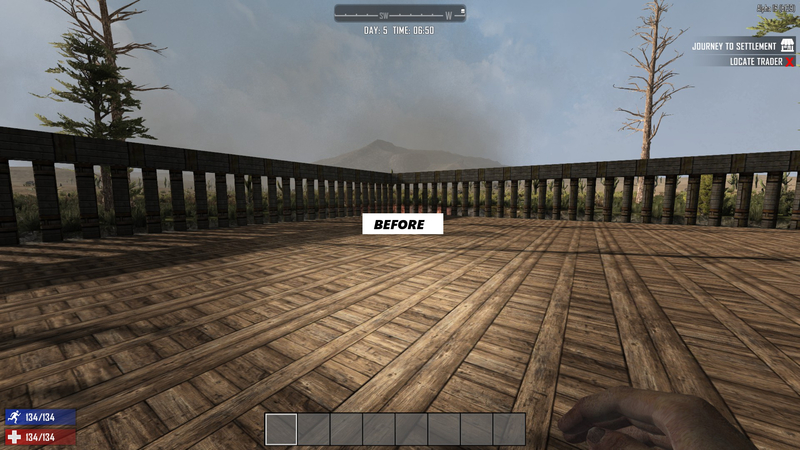 Two indicators were added to the top and bottom of the compass to show which way you're facing. Outside temp, and Elevation added to the right of day and time under the compass. 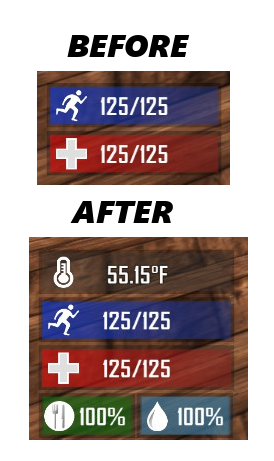 Added buff icons with description and timers. Plus up to eight can be displayed. Increased forge input from 2 spaces to 3 spaces. Increased crafting queue from 4 spaces to 5 spaces. Increased all workstation outputs from 6 spaces(3x2) to 9 spaces(3x3). Expanded Quest Trackers objective entries to hold up to 12 entries. Simple UI No Storage does not include the following. Does not include increased player built storage. Does not include increased minibike storage. 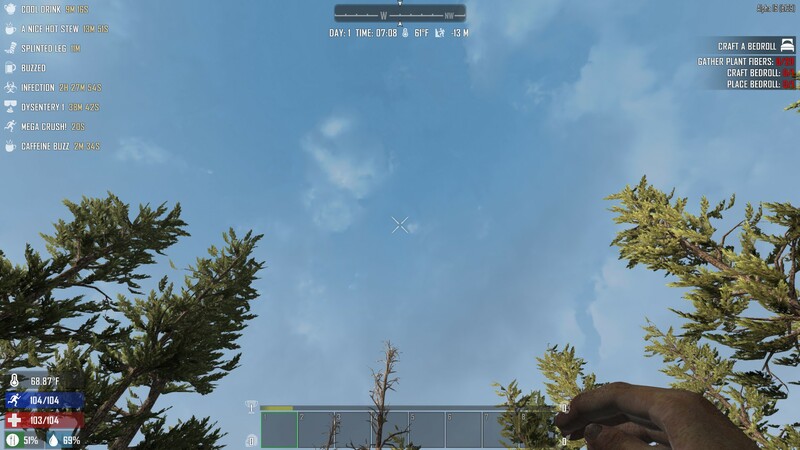 Simple UI Lite is the HUD only and does not include the following. Does not include increased forge input. Does not include increased crafting queue. Does not include increased workstation output. You will not see the increased storage size until you build a new storage container or upon building\rebuilding the minibike. You may even have to start a new game in some rare cases to see the increased storage size. All previous versions of this mod can be found at the nexusmods link. If using less than a 16:9 resolution download either the lite or no storage version. Only follow the below instructions if you are not running any other mods. Download the zip file of your choice and extract the contents to your 7 Days To Die installation directory "\steamapps\common\7 Days To Die" overwriting any files when asked. If running other mods or a different game version than listed then you will manually have to merge this mod in. However with how this mod was made it should be fairly easy to do. 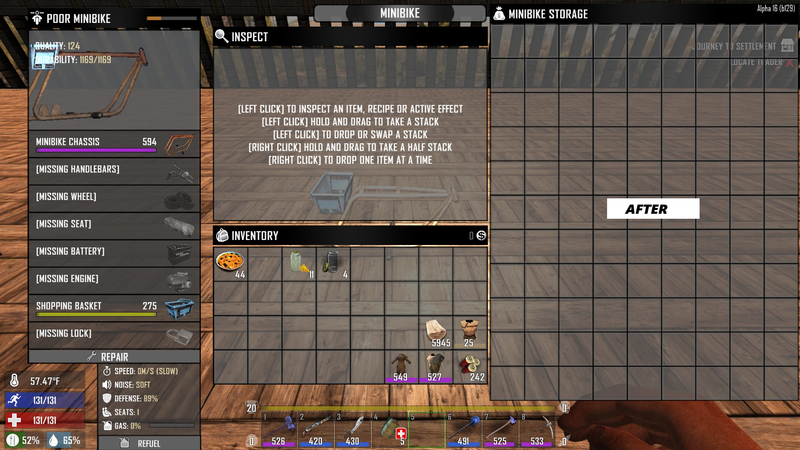 Right click on 7 Days To Die in your steam library and select properties. If you want to see this mod in action check it out on dhlmaster's YouTube channel. Added more comments to better note some of my changes in the xml files. Further seperated date and time from temp and elevation to try and prevent overlap in foriegn languages and really high number of days. Updated to Alpha 16.2 (b7). Fixed xp bars background and fill so it no longer overlaps bottom border. Returned toolbelt holding highlight back to original thickness for better visibility. Shifted temp and elevation slightly more to the right so it's not so close to the time. Renamed Simple UI No Storage to Simple UI Lite. Updated to Alpha 16 (b138). Moved buff icons and timers back down to the bottom left above player temp. compass indicators changed back to white to better match the ui. wind icon and reading removed. Outside temp and elevation moved to the right of day and time under the compass. 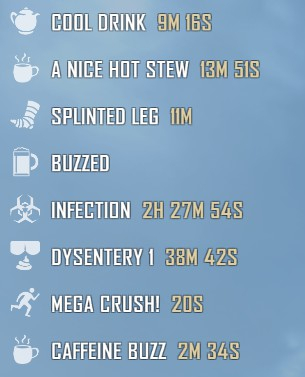 Added buff icons with description and timers to the top left corner. Plus up to eight can be displayed. Minor code cleanup and removal of no longer used windows. Added versions for A16 (b119) - Thanks goes to iicecube for testing. Toolbelt holding color changed to green. Last edited by stedman420; 05-02-2018 at 04:54 AM. Last edited by stedman420; 07-04-2017 at 03:00 AM. Yes great simple and clean UI of most without those extra name logo..
Last edited by iicecube; 07-01-2017 at 01:15 PM. Could you try to add-in the buff timer effect as well as we dont have to keep going in to our char tab to view in your next update? Possibly. I'm thinking of dropping the wind and moving the temp and elevation over with the day and time. Then putting the buffs with timers in the top left corner. I'll have to see how it looks though. EDIT: Any thoughts on how this is looking? Last edited by stedman420; 07-05-2017 at 12:39 PM. Mhm quite looking good at least its wont really destroy any other function as well.. But see if you can do one for b119 too? Last edited by stedman420; 07-05-2017 at 06:04 PM. Okay will test out and see how is it, but may i know what is no storage version? As in those not using the increased inventory mod? 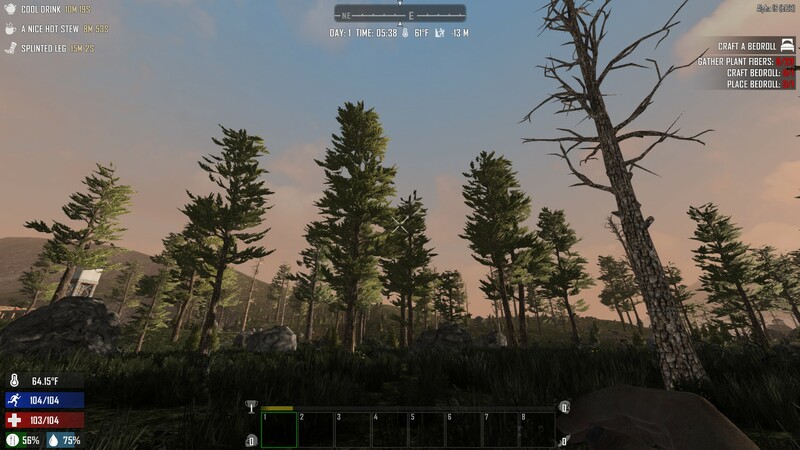 Ohh so if those running inventory mod but below 16:9 resolution which one to use? If using a separate storage mod I recommend using the one without increased storage for maximum compatibility no matter the resolution. My increased storage is an xml edit only and only affects the player built storage containers and minibike storage and is based on a stock backpack size. It only requires a 16:9 resolution or better so the larger storage windows fit on the screen since I made them as big as I could without scaling the ui. Okay understood, cause i using my own size of width:height so i will be using the non storage version..
At the moment your no storage version is having error 404, u might check it out..